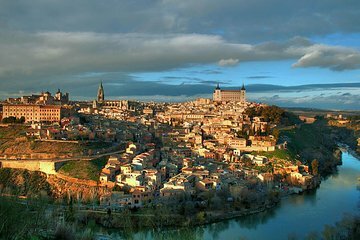 Descubre el encanto medieval de Toledo en un tour personalizado de 2 horas desde Madrid. Elija entre tres formas diferentes de descubrir los barrios históricos de la ciudad en la cima de la colina y los puntos de referencia importantes. Vaya a su propio ritmo en un recorrido a pie con audioguía independiente o descanse sus piernas en un tren turístico que serpentea por las estrechas calles de la ciudad. Alternativamente, elija una opción de brazalete turístico que le permita ingresar a los seis monumentos más importantes de Toledo, incluida la Iglesia del Salvador y la Sinagoga de Santa María la Blanca. Comentario grabado por auriculares de audio. City was very pretty but we didnt get to enjoy it. We were booked on the morning tour at 11 AM but two weeks after we bought the tour and printed vouchers the tour changed the time from 11 AM to 10:30 and NOBODY NOTIFIED US! We arrived early at 10:45 only to be told that we missed the bus. The person at the counter said someone should have told us about the time change and she got us in the afternoon tour. She vas very nice and helpful. In the afternoon the bus was 30 minutes late leaving and by the time we got there we only had one hour to see the city and that included grabbing some food to eat. Apparently the afternoon tour runs shorter. We were actually on the bus longer than we were in the city! To make matters worse we were at the pick up meeting point 5 minutes early and the bus was 25 minutes late and it started to rain. We got back later than we were told and were late to our evening show and missed half of the flamenco dancing! Great trip! Bus was comfortable with hotel pickup. Things were well explained as to what we would be doing for all the different options selected. Having been to Toledo before on a less well organised tour, we knew what we wanted to do. The main thing to remember is that there is a LOT to do there. Do not try to pack too much into your day. Muito boa a empresa, respondeu rapidamente, o tour saiu no horário certo e a empresa é confiável. We got to Toledo in about !hr. Our first stop was a souvenir shop on the way to use the Bathrooms. You have the option of buying here but i don't recommend it you will see wen u get to toledo Everything is cheaper there!! i spend double the here the only good thing is that they accepted my AX card. Toledo was Beautiful and yes the tour says only 2 hrs but in reality is 5hr wondering by yourself, enough time to have lunch and brunch. For the touristic train beware that your train time is not schedule until you get to their booth to redeem it and then they tell you until what time is the next departure is about every 30min it come back. By the way I recommend getting to the meeting point by 4pm if it was at 4:30 because they gave us a mini bus tour that includes the view from the outside of the city...and then finally comes back at 4:30 and picks up everyone else. We got back to Gran Via Madrid about 7pm not bad for it was still daylight. I changed to a full day guided tour to be able to see Toledo cathedral on a Sunday and paid the guide the difference in price 40 euros. Not possible to do that with scheduling of this DIY tour on a sunday. Had been emailed that this was a 2 hour trip but it took almost an hour to get to Toledo, and we were then told we had 6 hours there. We went on the tractor train around the town, which was good as it allowed us to see the town from the outside- and it is very pretty. Lots to do in the town- so the time was not too long. Didn't know which bus to get on when got back to stop though as it wasn't marked- but with limited spanish and gesture we managed to get on the right one. Badly organised- but good place to go.